Mattel's Masters of the Universe Classics line does what the original did very well: reuse molds. Before the body was reused on other figures, it started life as Skeletor, the Evil Lord of Destruction. With about 17 meaningful points of articulation and a decent cache of gear, it's on the short list of must-have figures in the line. Why? Because it's freaking Skeletor, that's why. Standing about 7-inches tall, Skeletor is exactly what fans wanted. A Four Horsemen sculpt, gobs of articulation, and just the right accessories-- even if those accessories are very purple. Rather than update the designs like in the 2002 line, Mattel opted to make larger, more detailed, and better-articulated versions of the original figures. 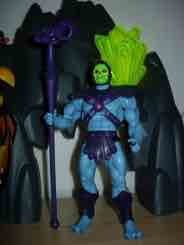 As such, Skeletor's Havok Staff is entire purple, and that ram's head is also still purple. Sure, you can say they're cutting corners, but generally speaking any corner-cutting they do on figures from the original early 1980s line are precisely what they did on that original line. Keeping in line with that original deco, Skeletor has very little that the original figure did not have. Sure, there are painted toeclaws, some fading to the yellow and green on his face, and a little color on his armor, but these are all very subtle additions to a toy that genuinely.shtmlires to be the best possible update of the original. His hands had no problem holding his weapons, and the armor has space to tuck away the sword if you're so inclined. However, I should note I wasn't able to easily combine two sword halves into a decent looking whole. It was a nice idea but, at least on my samples, it didn't seem to go over so well. While the 2002 line had excessive detail and battle-action poses, these new figures were designed with older fans in mind. Skeletor has tons of articulation and will probably be able to fit on the inevitable Panthor toy, but he doesn't have a slashing action or kung-fu punch. He's just a tall Skeletor figure without bow legs or wacky buttons. If you collect Mattel's DC Universe line, these are pretty similar in construction. Except, of course, Skeletor has removable purple armor and a non-removable hood to match. A note for collectors: This figure originally came out in early 2009. In 2010, it was reissued in an altered package that had a small yellow burst that reads "the original" on it-- which indicates that it is not the original release. A third release has been confirmed for the near future, but it is now known if any changes will be made this time around just yet. The pictured figure is the 2010 rerelease, which is said to have had a slight alteration made to the hand for better holding his accessories. As mine is problem-free, I assumed it worked. The same basic design was altered to make a "Robot Chicken"-themed Skeletor with a missing tooth in 2010 for Comic-Con, a Keldor figure (also in 2010), and a Toys "R" Us exclusive DC Comic-themed deco Skeletor. Heck, all of these were in 2010. So if you weren't able to get a Skeletor this year, you weren't trying.